This "sun" mosaic by Mark Kretzmeier marks the entry to a residential theme garden in Seattle, WA that pays homage to the four basic elements: earth, wind, fire and water. Kretzmeier started Metamosaics in Portland, Oregon, about 12 years ago, combining his twin interests in art and construction. "I always liked geometric patterns," he said, "and anything that was pixelated." Kretzmeier learned his craft by studying the classic book on pebble mosaics, The Art of Pebble Mosaics by British artist Maggy Howarth. He recently finished a design of sea creatures for the Zoo in Jacksonville, FL. It depicts a redfish, a dolphin, a turtle, a pelican and more, among the waves of the nearby Trout River. That was his largest project to date, but he's now working on a design that's twice as big for a children's park in Memphis, TN. 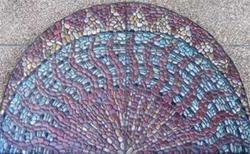 Kretzmeier says that most of his mosaics are used as highlights in residential gardens, or sometimes as doorsteps. He uses local stones wherever he works, all tightly packed into a flat plane that's easy to walk on, even in high heels, he says. The photo at left is of a mosaic in a courtyard at a transitional residence for women and children -- and it measures about five feet in diameter. Sometimes he uses recycled glass or even glass marbles as components in his designs. Each element in the mosaic is individually selected and tightly packed into a dry concrete mix that is "activated" once the design is completed. According to Kretzmeier, the mosaics do fine in northern climates as well, where he uses a high strength concrete that will withstand the cold weather. This photo is a vine motif used in a front walkway, a nice touch for a garden entry. Kretzmeier designs most of the mosaics himself, although he's willing, of course, to work with clients to get the kind of design they want. He usually works on location, and designs begin at $50 per square foot. Mosaics might not work in every garden, but if your clients truly desire something unique, you should give Kretzmeier a call. 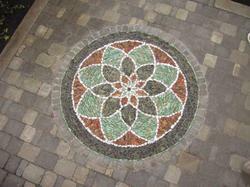 In the past, he has manufactured some mosaics that can be shipped all in one piece.